I discovered that the C-bout ribs I glued in place last night were actually not in good contact, so I will steam them off and re-install them. No biggie, but not happening today. 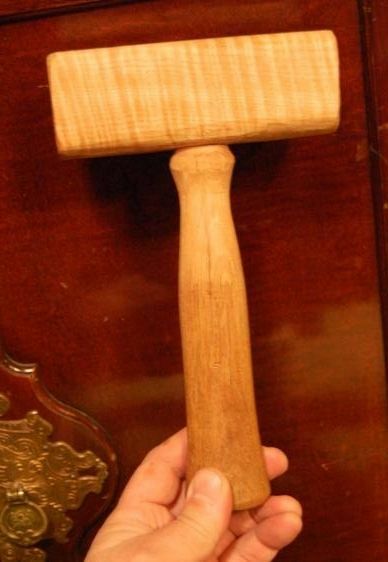 I laid out and began cutting the scroll and neck for the cello, and, partway through, decided I really needed a carving mallet. (sigh…I know…) Anyway, I had a chunk of a neck billet left over, and a piece of an old sledge-hammer handle, so…. Anyhow, I also have needed a drill press, as, when my youngest son moved out, he took with him the only drill press we had; so I found one (1/2 hp, 5 speed, 5/8″ chuck) on Craigslist, and this evening we went and got it. The scroll is cut out and the volute trimmed about halfway around the curl (all the outer-most turn). All the ribs are bent, and the glue-pot is full– so tomorrow evening I hope to try again. Great weather we are having, so I may get to do a lot more outside. The hammer is nice, but I am really disappointed that I have not gotten further along on the cello. Tonight I got home too tired to start anything, so I am just going to bed early, hoping that tomorrow I will get home posessing more energy. I worked overtime, today, teaching the properties of metals and the various processes used in destructive testing procedures. All good stuff, but I would really rather build a cello….